What do you know about Cambodia? Angkor Wat? The bloody and brutal Pol Pot regime? To most of the western world Cambodia is a mystery. Motivated by a long held dream to see first hand the mysterious temples that had been reclaimed from the jungle, I planned a visit to Cambodia. The lack of tourist infrastructure made research challenging so I concluded that joining a small group tour would easily remove the uncertainty. With only a smidge of knowledge of what my experiences would entail I focussed my speculations on the food I would eat. I imagined a fusion of Thai and Vietnamese cuisines, a marriage of freshness and complex aromatics balanced by the richness of coconut milk, and while in some instances this is true, I have since concluded that Khmer food is truly unique. Tourists in SE Asia expect to be served a sanitised and modified version of the food that is eaten everyday by the local people. Cursed by sensitive digestive systems and cultural inhibitions most visitors refuse street food and local delicacies of questionable provenance. I was no exception. The rural Khmer harvest an annual rice crop to sustain themselves for the year. A small patch of land is given over to vegetables and various culinary herbs grow wild by the roadside. Morning glory greens are cultivated around the edge of paddy fields while banana and coconut palms liberally dot the landscape. Chickens scratch about the home yard providing eggs whilst in their prime and fish, snails, frogs, crabs, rice paddy rats, water snakes crickets and other bugs provide valuable sources of protein. Most rural families have a cow or water buffalo as a work animal but no dairy foods are consumed. The beasts are kept purely for their reproductive value, labour and meat. Snacking is a national pastime as is swinging in a hammock. Roadside vendors and village markets stalls not only pedal local delicacies but also provide hammocks in which to catch 40 winks. Barbecued food on skewers are common offerings at these places. 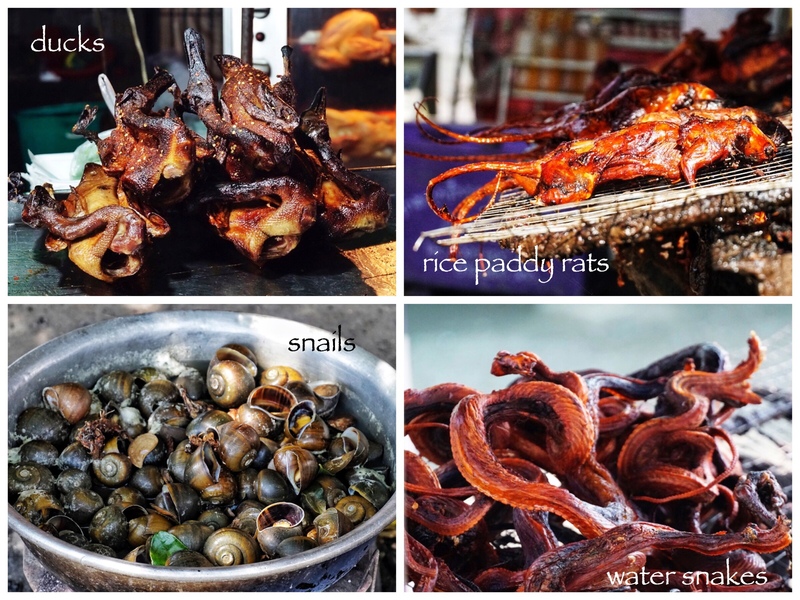 Rice paddy pests such as frogs, water snakes, fruit bats, and rats are deep fried, spiced then grilled, crickets and other bugs are seasoned and deep fried. Fish is commonplace, even inland thanks to the vast and bounteous lake, Tonle Sap. Steamed glutinous rice with banana and coconut are offered in many styles to satisfy the sweet tooth. The glazed grilled meats looked and smelled tempting until a head, claw or tail came into focus and the brain comprehended the physical structure of the skewered creature. My western sensibilities subsumed my curiosity and I was unable to set aside by inner revulsion. I did eat a cricket, one cricket, straight from the fryer. It was okay. I was left totally in awe of the resourcefulness of the Khmer people. The simplicity of the Cambodian cuisine struck a chord with me too, no need for “manufactured” food, keep it simple and natural. How have I missed these posts of yours? This is a wonderful culinary tour of a place I know very little about. Yes, I am one of the large number who find Cambodia a mystery. 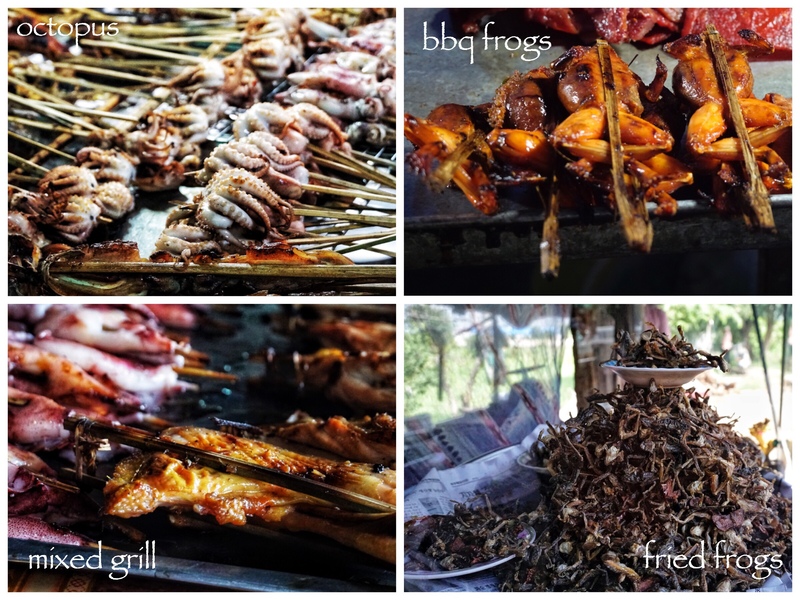 Although I have tasted frogs’ legs and can image that BBQ frogs’ legs might be very tasty. Wow is all I can say. Glad you were well the whole time and you had a great travel experience. Aw thanks Debi, Cambodia was a wonderful experience for us, which in the end, I think I put down to our local guide, Sam. We saw the real Cambodia desperately trying to get on with rebuilding / bettering life. My dodgy gut really influences my decisions about what I do and do not try. I was well for the whole trip thankfully, a first for me when travelling in Asia. How interesting, I’d of given each a try as long as I had a good medical evacuation insurance plan. In my visits to China I’ve eaten many weird items, but fried scorpions was the most challenging. In the end, it tasted crunchy and of peanut oil it was fried in, likely like your cricket. What a wonderful trip! I’d have trouble with some of those, too. But my husband would jump right in to all. Hi Michelle, he’s a brave man…. Hahahahahaha! What a great post! One cricket. Well, I don’t blame you. I’ve certainly tried haggis, but I don’t think I would want to try a rice paddy rat. We’re going to Machu Pichu next year and I won’t appreciate seeing grilled guinea pigs. Hah, guinea pig is right up there for sure. It was a much a fear of poor hygiene as “unusual” food that held me back. Which is only smart. The only time I’ve gotten food poisoning in my whole life was in Rwanda. I have such an iron stomach that I was positive I was immune to the water. Welcome home ! I was enthralled by your Instagram photos but not nearly as much as I am by this fascinating post. Politics twice stopped me from reaching Angkor Wat in my early twenties a lifetime ago: since then my interest in the country has widened way beyond that perimeter. Your food photos are fantastic! I have no intolerances and would have dived head first into all you saw: frogs, snails and snakes are old food friends, bugs and rats would have taken a moment to reach for . . . Oh, are you aware how many Australians retire to Cambodia these days for a lifestyle their pension does not allow in Australia . . . ? Sandra, if you ever have a moment, click onto the basically free ‘International Living Australia’ newssheet – it arrives almost daily and is a fascinating read of the stories of all the Aussies who have moved to Cambodia, Malaysia, Vietnam etc in search of a ‘kinder’ lifestyle . . . I think their resourcefulness will always stay with me. (I don’t think we saw any beggars, for instance. Everyone was selling something.) And I have developed a taste for sticky rice though the fish in our homemade Fisk Amok fell apart. Will have to find a more chunky fish. So good to be able to share our memories on WP Al. I agree, everyone was industriously making their way in the world, no free handouts I guess. Try cooking the Amok sauce without the fish, then adding with just enough time to cook through, oh and avoid stirring, be very gentle. These are a couple tricks I’ve learned making messy Indian fish curries. Haha you are making sense Sherry. Mal and I went to Vietnam with friends then we both joined the tour in Cambodia. I highly recommend Peregrine Adventures for Cambodia. We had a fantastic local guide. This entry was posted on November 15, 2018 by ladyredspecs in Cooking, Food, travel and tagged cambodia, khmer food, local delicacies, Travel.